Santa Cruz police and city leaders lambasted the Department of Homeland Security at a news conference Thursday, accusing them of conducting secret immigration raids earlier this month and lying to the police department while doing so. Under question is an early morning raid on Feb. 13 that was the culmination of a five-year investigation and drew on more than 200 local police officers and federal agents. Ten members of a "notorious transnational gang" were arrested across 11 locations in Santa Cruz, Watsonville and Daly City on a host of charges, including drug trafficking and conspiracy to commit extortion by force, according to ICE spokesman James Schwab. The suspects belonged to the Santa Cruz Salvatrucha Locos 13, a subset of the Mara Salvatrucha 13 (MS-13) gang, according to the U.S. Department of Justice. They were believed to be planning assassinations, which determined the timing of the raids, Deputy Police Chief Dan Flippo said during Thursday's news conference. But police Chief Kevin Vogel said that federal officials have also admitted to detained some Santa Cruz residents who did not have a criminal history or any ties to gangs. They were singled out based on their immigration status, according to NBC-affiliate KSBW. Schwab explained on Thursday that "authorities encountered 11 illegal aliens" at places where they served search and arrest warrants. Those people were "detained initially on administrative immigration violations due to their association with suspected members of a transnational street gang," he said. Ten of them have been released, but one person is still in custody "due to his criminal history and possible ties to the ongoing investigation," Schwab continued. Meanwhile, Flippo elaborated at the news conference that six people were taken to a Homeland Security facility. Five of them were released on GPS monitoring, while one was released with a USCIS interview notice, known as a G-56 form. Four others were detained and issued the G-56 form at their residences. "I am outraged," Flippo said. "I am disgusted." Vogel echoed the same sentiment. "This flies in the face of the values that our community holds very deeply. The community has an absolute right to be angry over this," he said. Santa Cruz is a "sanctuary city," which bars police from cooperating with federal authorities investigating immigration violations. It remains unclear whether detentions were also carried out in Daly City and Watsonville. For his part, Schwab countered Vogel's and Flippo's claims by saying that a special agent notified the police chief several days before the raid that "any non-targeted foreign nationals encountered during the enforcement actions ... would be held briefly until determinations could be made about their identities and case histories." Vogel "acknowledged this possibility," Schwab said, and both groups "agreed that no foreign nationals would enter the Santa Cruz Police Department’s facility or their police vehicles." Schwab also rejected the Vogel's claims that ICE "secretly planned an immigration enforcement action in hopes there would be new political leadership that would allow for an alleged 'secret' operation." He further warded off the police department's claims by saying that law enforcement is "fluid" and officers are often forced to react to situations they were unprepared for. "All of the arrests were conducted in accordance with agency policies and consistent with the special agents’ authorities under federal law," Schwab emphasized. However, Vogel insisted that he only agreed to work with federal officials because they repeatedly assured him that immigration detentions were not part of their plan. Had he known Santa Cruz police officers were helping with an immigration raid, they never would have participated, he said, issuing an apology to the community at large. The pre-dawn raid raised the hackles of Santa Cruz's immigrant community because the arrests followed ICE raids around the United States. At the time, Santa Cruz police responded to the concerns by releasing a statement assuaging people's fears. It read in part: "This operation was not associated with enforcement of federal immigration nor deportation investigations. The City of Santa Cruz and the Santa Cruz Police Department does not and will not participate in immigration enforcement or arrests." It continued: "The men arrested during today's operation were all members of a violent criminal organization that has preyed upon and threatened the community." However, on Feb. 14, more than 100 people showed up at a City Council meeting to voice their fears, KSBW reported, accusing ICE of uprooting families based on people's immigration statuses. Vogel and Flippo, who had also assured the Santa Cruz community that the raids were not led by ICE, were in attendance and grew worried. "The information provided from our community sounded credible," Vogel said at the news conference. Flippo walked out of the City Council meeting to call high-ranking Homeland Security officials to dig for answers, according to KSBW. No one has taken personal responsibility for the immigration detentions, but federal officials have acknowledged that they did, in fact, happen. But officials have denied the police department's request for the names of the immigrants who were taken into custody. "I am very angry this occurred and I'm disgusted this was withheld from me," Flippo said. Vogel added: "This has violated the trust of our community, and we cannot tell you how disappointed we are by the betrayal of the Department of Homeland Security." He also apologized to the immigrant community that calls Santa Cruz home. Meanwhile, Santa Cruz Mayor Cynthia Mathews said she was "heartbroken" that families have been "torn apart," and demanded an investigation into the raids. Special Agent-in-Charge Ryan Spradlin retaliated by saying, "It’s unfortunate when politics get intertwined with a well planned and executed public safety operation. When politics undermine law and order, the only winners are the criminals." 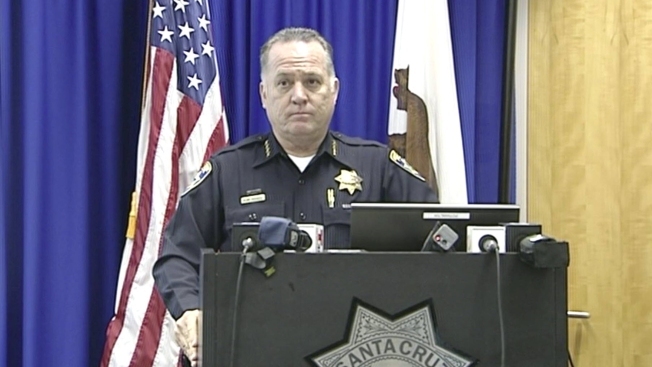 Separately, Vogel stressed that the 10 gang members who were arrested, posed a genuine threat to the safety of Santa Cruz residents. A federal grand jury has indicted seven of the men for conspiring to extort drug dealers and three for conspiring to traffic methamphetamine. The raid has led to the MS-13 gang's dismantlement, Vogel said on Thursday. Velarmino "Meduza" Escobar Ayala, Tomas "Profugo" or "Caballo" Rivera, Ismael "Casper" Alvarenga Rivera, Willfredo "Chino" Edgardo Ayala, Jose David "Largo" Abrego Galdamez, Melvin "Sharky" Lopez and Alexander "Pocar" Martinez Flores are facing extortion charges, prosecutors said. According to the indictment, the seven men had conspired to threaten Santa Cruz drug dealers and those close to them with violence in order to take their property. If convicted, the defendants face a maximum sentence of 20 years in prison and a $250,000 fine. Meanwhile, Gerber "Choco" Morales, Emilio "Diablo" Escobar Abarnga and Josue Alcedis "Penguino" Escobar Cerritos allegedly conspired to engage in drug trafficking, prosecutors said. Since March 2015, the three men conspired to possess with intent to distribute 50 grams or more of a substance containing a detectable amount of meth. If convicted, the defendants accusing of conspiring to commit extortion face a maximum sentence of 20 years in prison and a $250,000 fine. Those convicted of conspiracy to possess 50 grams or more of methamphetamine with the intent to distribute it face a maximum of 40 years in prison and a $5 million fine, prosecutors said.